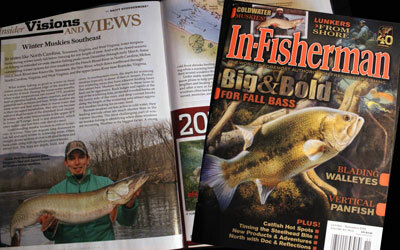 "Winter Muskies Southeast" - Printed in the Oct/Nov 2015 issue of In-Fisherman magazine in the Insider Visionsand Views Section, Britt discusses the advantages and tactics of puruing muskies during the winter in the Southeast. A big shout out to SMGS clients Nat Ramos (cover) and Mike Evans for making the magazine with their bruisers they caught with Britt in the winter of 2015. Click here to purchase a digital subsciption. 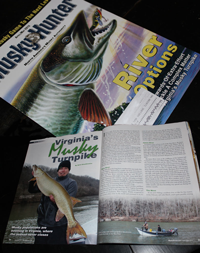 "Virginia's Musky Turnpike" - Printed in the April/May 2015 edition of Musky Hunter Magazine, Britt discusses various successful patterns for each season on the New and James Rivers. If you fish these rivers, or rivers in general, you can purhase a digital edition by clicking here. Why Cold Water Muskies? - Britt discusses one of the "best" times to fish for muskies on southern rivers and what to expect from past experiences. Lure Profile - Llungen Lures - Britt takes a look at Llungen Lures' inline spinners and explains why he has confidence in them and why they produce big fish. Going Small to Go Big - Britt examines the importance of using smaller inline spinners and their place in the hunt for big fish. The Transitional Period - A brief look at the transistional period of September and what can make it a hot bite for big fish. I am often asked; “When is the “best” time to fish with you?” And my answer usually spans several minutes explaining the different season and conditions. If you don't like the cold, then the post-spawn bite of May and June could be your best time. If you like to throw top water plugs, then the full moon in September may be a good time. But if you want the “best” chance at hitting a multiple fish day, then there is no doubt that mid-November through the first part of March is your answer. The next question usually goes like this; “What makes that period better than the others?” And the answer is two words, “cold water.” Water temperatures usually begin to start cooling in mid-September prompting some early fall movement, but the heat of the action usually doesn’t start until water temps dip into the low-50’s and high 40’s. This trend normally doesn’t start to happen until sometime in November. Water temps will continue to cool into the low-40’s and high-30’s into February when water temps shift to a warming trend eventually bringing an abrupt stop in the winter bite. Once water temps hit the upper-40’s, fish go into full-on spawn mode and the bite becomes “funny” as we call it as we shift to the more aggressive smallmouth. “What makes cold water that much better for musky?” In my opinion, the biggest advantage of cold water is that it presents an “eat or die” mentally for the northern musky who thrive in cold water conditions. All of the forage they have been picking over during summer has now become mostly dormant and harder to find in the cold water, and fish are less picky and more willing to eat as opposed to following and passing your bait up for the next easy meal. If they are going to expend the energy to track a bait, life or death usually dictates an eat. It also triggers many more successful figure-8’s as well making the cold water more work and even more fun. Several examples come to mind that back up this theory starting with December 2013. We just had our first child in December, and with all the family in town and in a buzz over their first granddaughter, no one faulted me for slipping out to the river for two or three hours an evening here and there during that period. Looking back at my records, I fished 8 days (24 hours) from 12/10 through 12/28 landing exactly 14 fish averaging a fish about every hour and a half. I had four multi-fish days during that time and the top fish went just a hair under 47”. Not bad for a new dad with very little sleep, and a great example of the consistency that can be had in December. The next example that comes to mind is February 4th, 2014. My good friends from Adams Custom Lures had come up to fish with me for an article that I was writing for a major publication, and we had intended to fish the James River. With a 10’ rise overnight, we shifted gears and settled on the New River. With catches starting at 12:01pm and ending at 3:02pm with about 5 hours of fishing, we hooked 10 fish and put 7 in the boat, all being 40” or larger, for an average of one fish landed every 45 minutes. And to really put it into perspective how good the bite was, we caught all of them in about 75 yards of river. The last example falls on March 3rd, 2013 when I was fishing with two good friends on the James River. We had been putting a lot of time in on the river during the winter with a goal to catch 20 fish in 20 days of fishing. Going into March 3rd, we had landed exactly 20 muskies in 19 days, and we were so in tune with the fish and conditions that we could feel something “big” was getting ready to happen. In fact, I had just done a fly-fishing for musky seminar at Orvis Roanoke with a fellow musky guide, and we were having dinner together. He was leaving the next day for a fly fishing show in Maryland, and we told him he was going to miss it. And unfortunately for him, we were right. We fished the entire day and hooked and encountered over 20 fish; so many in fact that we lost count. The final tally for the day was 11 fish landed (about 1 per hour) marking one of the most memorable days I can ever remember on the river. The bite was so good that we even had a very rare double. Our final total for the 20 days that we fished was 31 landed averaging about one fish per every 4-5 hours for the entire winter. By describing some of the advantages of the cold water season and giving you some examples of our results, particularly data for entire periods, hopefully, you will have a better idea of why the cold period can be so good and what you can expect. Days like those mentioned above do not happen every time out, but the cold water will help put the odds in your favor and give you a much better chance of experiencing days you will remember for a lifetime. Musky fishing is a tough sport, and a lot of dedication and hard work goes into experiencing successful days like those I have mentioned. To end, make sure to choose your seasons wisely to make the most of your efforts. We've been throwing a lot of in-line spinners this summer, and our favorites have been the Llungen Lures LT-9, DC-8, and DC-9. The LT-9 is a single fluted #9 blade and the DC-8 and 9 have double #8 or #9 blades. The LT-9 is a great, smaller profile spinner that can be casted a mile and burnt with ease, particularly in summer months when the fish seem to want a speedy retrieve. The double blades add the extra thump when you need or want it. I love the skirts on these spinners, particularly, how they reinforce the rubber bands with zip ties so you never have to worry about the band dry rotting and your skirt falling off. The skirts are extremely breathable and move a lot of water. I also like how the skirts have a nice, consistent spin as the bait is retrieved. I have found that the 6/0 Mustad hook that comes stock on the baits is a bit small for me and I have lost some fish due to the hook bending. I have stepped up to the 7/0 Mustad and the lure performance is not affected and my landing ratio has gone way up. If replacing the heat shrink wrap, make sure to use the 1/4" size. These baits have definitely been a top producer for us this summer. With the rise of musky fishing, more and more anglers are faced with the daunting task of selecting baits. And there is no doubt that selecting the right baits for the right time of year and gaining confidence in those baits can be intimidating. Unfortunately, it often comes with a lot of trial an error leaving us with hundreds of baits we don't use while we rotate through a variety of the same 5-6 confidence lures each season. Summer is no exception, and I've received several emails on why I like the Llungen Lures LT-9 or any smaller single bladed inline for that fact. The answer is very simple, fish have been stinging it, and I have a lot of confidence in it right now. But how did I get there? Not being a big inline guy, I started the summer knowing I needed to better hone this skill. I picked up a bunch of different spinners, and threw all the big double 10's right off the bat because it seemed as though that all my musky fishing buddies were throwing them. After lazy follow after follow, I noticed fairly early on that I simply did not have the reel, a Curado 300EJ, to fish the spinner fast enough without burning the insides of the reel up. Instead of spending money on a bigger reel to speed these baits up, I started looking through my spinner lineup, and settled on a single-bladed LT-9 in a very ordinary, natural looking color. I could cast this spinner a mile and absolutely burn it with ease in the super clear water. On my next trip out, I put this bait on and just after a few casts I struck a beast that I don't even like to contemplate the size of loosing it right at the boat. Over the summer, the single-bladed spinner with a #9 fluted blade has been one of the top producers for us across the board. It is not a a big spinner, and looks pretty average on the scale of "pretty" or "flashy" looking spinners, but the battles scars keep accumulating as fish have knocked it crazy. Just recently, after a very long cast, I noticed a musky following the spinner at a distant. Immediately, I put the Curado in overdrive reeling as fast as I possibly could getting KO'd by a big fish about 2/3 of the way back to the boat. While big may be the craze, and I certainly love my big baits in the late-fall, there is something to be said for the smaller, old school style baits. So the next time you a looking for a new inline, and you are overwhelmed by all the big, flashy choices, consider trying the smaller, ordinary looking inline. You may be surprised at the "Big" results like the fish above that fell for a small inline! One of my favorite musky seasons is the transitional period of September into early- November. After a long, hot summer, brief periods of cool-down can really jump start the bite and put the muskies on the move, especially around a full moon. One of my favorite tactics is to search out small depressions amongst heavy, shallow current and target overlooked big fish with top water plugs and spinners (Llungen Lures LT-9 in my custom color). I have caught very large fish in 2' - 3' of water in the middle of 3" - 4" shoals. Muskies love these areas for both food and oxygen, and they are great places to "hide" some of the largest fish in the river. If you haven't tied into a large musky on a top water plug or inline spinner in heavy current, it can be one of the most exhilarating experiences you can have in the world of musky fishing. The fish I am holding above was an absolute beast I hooked during the full moon period (5 days before/5 days after) in September of 2013. I was sitting anchored in 2" of water and this fish came out of 2.5' of water. She ate a top water tail bait, and it has to go down as one of the best fights I have ever had.